The passing of the first man on the moon – the great Neil Armstrong on August 25, 2012 (at the age of 82) is not necessarily unthinkable. The hero who inspired generations was greeted with an asinine display of eulogies and obituaries in the social media. 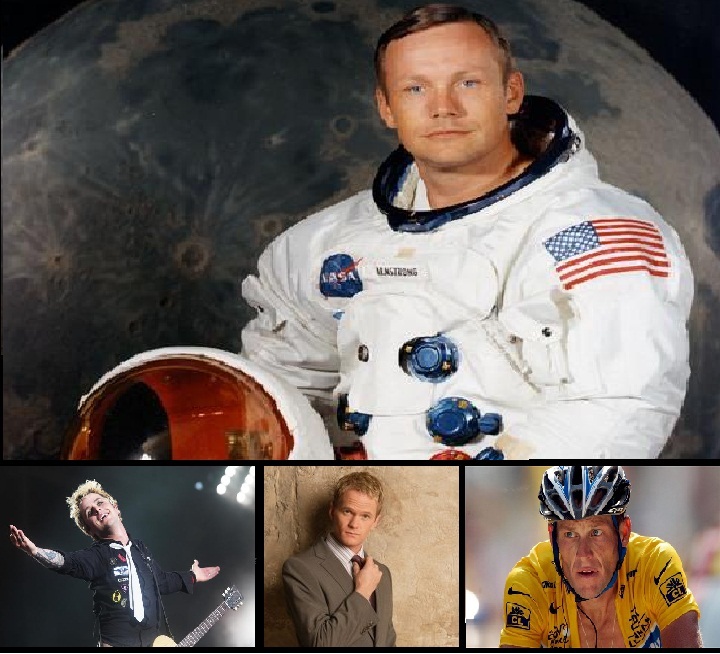 Facebook, Twitter, mySpace and Google+ users bid farewell to not only the astronaut Neil Armstrong but cyclist Lance Armstrong, rock vocalist Billie Joe Armstrong of Green Day and the fictitious pick-up appellation of the fictitious character ‘Barney Stinson’ (that’s a double fictitious – a made up name in a made up TV series) from ‘How I met your mother’- a different Neil Armstrong. The wretched incident is tragically humorous to be precise. Netizens (internet citizens) seemed not to be privy to the knowledge of the Apollo 11’s landing on the moon on July 20, 1969 (however disputed it may have become due to conspiracy theories). 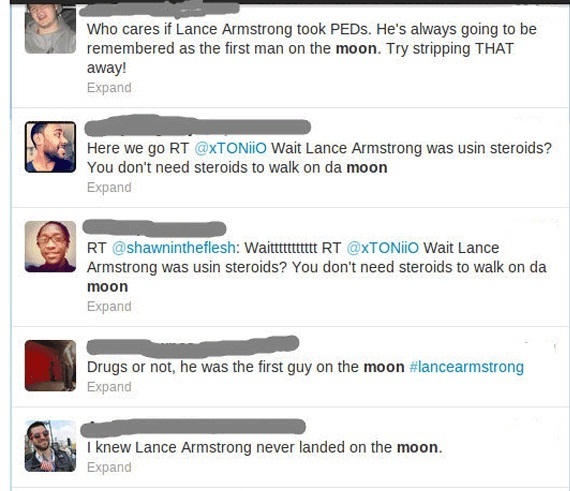 People commiserated with each other grieving about the fact that Armstrong was stripped of his medals due to usage of steroids (referring to Lance Armstrong). 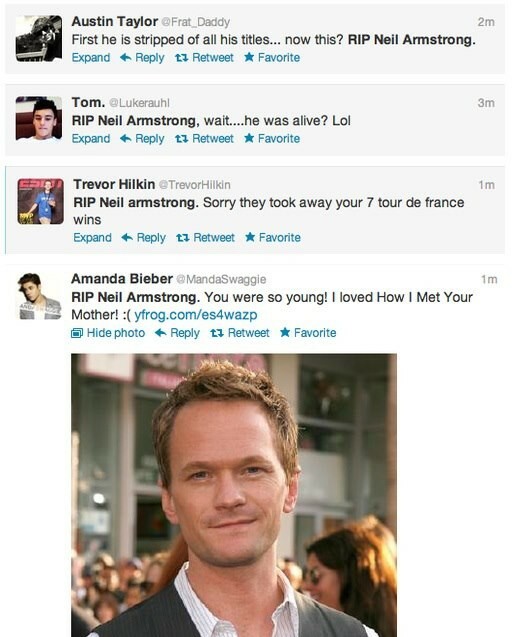 They were in tears for the ‘untimely’ demise of Armstrong (who sang for Green Day). The most ludicrous one was the last confusion. People relegated to a point where they mourned for a fictitious character out of a fictitious TV show. In a particular episode Barney Stinson (one of the lead characters of ‘How I met your mother’) assumed the name of Neil Armstrong to pick up girls at a bar. People around the world lamented the demise of the individual out of the fertile minds of screenwriters. The hero of the millennium – an inspiration, Neil Armstrong who took the giant leap for mankind fell a little short of reaching the minds of the internet generation who are mostly aged between 14 and 27 years. This story, even though funny, presages the fear that the internet inhabitants are no longer the technologically sound individuals. The rising number of users of the social media may no longer be correlated with significantly relevant knowledge. Thus, it is high time the modern world woke up and acknowledged their heroes and read a book leaving their computers and mp3 players for a while.